We continue our virtual trip around the world in search of funny looking buildings with these 18 amazing pieces of creative architecture. Check out other interesting buildings in Funny Architecture Around the World [Part 1]. Not only is the Dog Bark Park Inn shaped like two adorable beagles, but it was actually carved in wood by husband and wife Dennis Sullivan and Frances Conklin. They saved money for this project by selling carved wooden dogs for 18 months. Visitors of this Bed and Breakfast in Cottonwood, Idaho, USA can still buy carved dogs and other animals in different sizes from the adjacent gift shop. You can even bring a photo of your pet and they will carve a replica of it in wood. The two giant dogs that make up the inn are named Toby and Sweet Willy and they offer accommodation for up to 4 people in the two bedrooms situated on two different stories. Also, the toilet is disguised as a fire hydrant. Originally built for the World Fair of Brussels which took place in 1958 (also known as Expo 58), the Atomium became one of the most iconic monuments of Belgium and of Europe. The structure, 102 metres high, has 9 interconnected spheres and it represents an elementary iron crystal enlarged 165 billion times. It was designed by the engineer André Waterkeyn and architects André and Jean Polak. When renovated between 2004 and 2006, the old aluminum covering the building was sold to the public as souvenirs in order to help pay for the renovations. The Atomium is currently a museum, hosting permanent and temporary exhibitions as well as providing educational activities for the kids. The flexible spaces can also be rented for conferences, seminars, parties or different other events. The Pickle Barrel House was designed by the author, illustrator and cartoonist William Donahey based on characters in his cartoon strip called “The Teenie Weenie”. These characters were 2 inches tall and lived under a rose bush in a pickle barrel. The real life building, located in Grand Marais, Michigan, USA, consists of two barrels: the bigger one is 16 foot tall and has two stories housing the living area and the bedroom; the smaller barrel serves as a kitchen and the two barrels are connected by a pantry. William Donahey and his wife lived in the building for a while, but since the interesting appearance of their house attracted many visitors, they decided to move in a more private place. Through the years, the building served as an ice-cream stand, an info booth and a gift shop. Palais Bulles or Palace of Bubbles was designed by architect Antti Lovag to become the residence of an industrialist, but after the original owner died before the work was completed the building was bought by Pierre Cardin to become his summer house in Cannes, France. The building has no edges or straight lines, it’s all curves and bubble shapes as a reflection of Antti Lovag’s architectural belief that the straight line is “an aggression against nature”. Because of its original appearance and its beautiful setting (on a rocky cliff overlooking the Mediterranean Sea), Palais Bulles is often rented out to host film festival parties and other big and glamorous events. 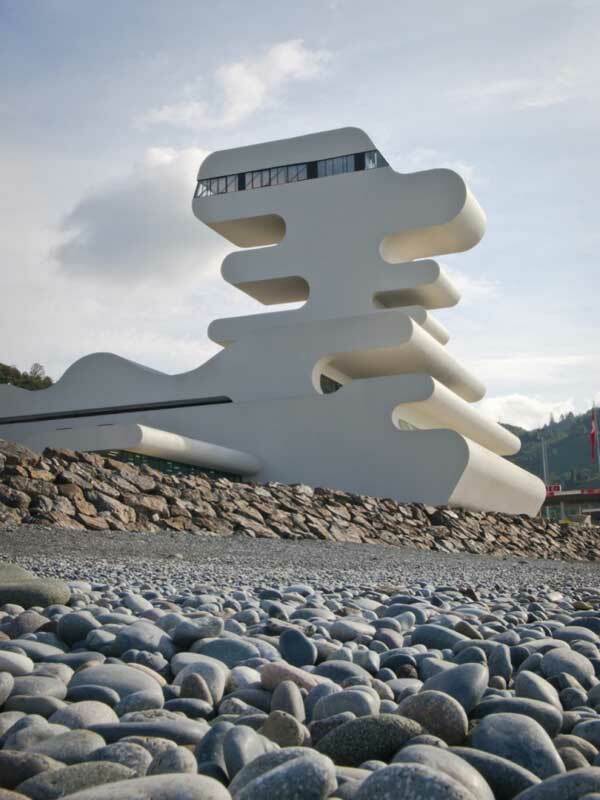 This unusual wavy shaped building is situated at the border of Georgia with Turkey and serves as a customs checkpoint. The building welcomes visitors to Georgia, in the small village of Sarpi, situated on the Black Sea shore. The weird wavy shape fits well in the setting of the undulating coast. Besides the regular customs facilities, Sarpi’s Border Checkpoint is used as a viewing platform and houses a cafeteria, a conference room and staff rooms. It was built by J. Mayer H. Architects at the request of Georgia’s Ministry of Finance. The Mushroom House or the Pavilion, situated in La Jolla, California, USA, was built and designed by Dale Naegle in 1968, for Sam Bell of Bell’s Potato Chips. Bell had a summer house on a 300 foot high cliff and wanted to add a guest house on the beach below. The Mushroom House is this guest house and is connected to the main building above by a 300 feet tramway. The Mushroom House offers a spectacular view over the Pacific Ocean, but unfortunately it is not open for public access. Nevertheless, it is worth seeing from the outside as well, a UFO-like building in the middle of a stranded beach. The Nakagin Capsule Tower, completed in 1972, expresses the vision of architect Kisho Kurokawa, who believed in a future world where people would attach and detach their apartments to buildings, making moving easier and more accessible. The Nakagin Capsule Tower, located in Tokyo, Japan, is made up of 140 concrete capsules, each with a surface of 300 square feet. The apartments, which are quite tiny, with a bathroom not very much bigger than the ones you find on a plane, were intended to serve as a place to crash for business people who couldn’t make it home between two working days. In time, the building started to fall apart so that nowadays only a fourth of the capsule apartments have permanent inhabitants, while another fourth of them are used as offices or guest rooms. The Vitrahaus is actually a pile of 12 houses stacked together in different angles creating a modern looking building which serves as a showroom for the furniture and home interior designs offered by Vitra, a German company. The building was created by architects Herzog & de Meuron and it offers a different view during daytime and night time. In daylight, the entire stack of houses is visible, but in the darkness only the brightly lit interior can be seen through the full length window walls. The Vitrahaus is set in Weil am Rhein, Germany. The history of this building is probably more interesting than its spherical shape. Situated in Vienna, Austria, Kugelmugel was designed by artist Edwin Lipburger who claimed the building to represent an independent micronation, The Republic of Kugelmugel, with its own currency, flag and a population of 1 resident and hundreds of non-resident citizens. The name of the building translates as “sphere bump” and is representative for its shape. Kugelmugel was originally built in the countryside in Lower Austria, but the authorities moved it to Vienna Prater Park. The United States Air Force Academy Cadet Chapel was designed by SOM architecture company and features a succession of 17 impressive glass and aluminum spires. The building is 150 feet tall and houses three different chapels with a separate entrance each: a 900-seat Protestant chapel, a 500-seat Catholic chapel, and a 100-seat Jewish chapel. The structure is a tubular steel frame of 100 identical tetrahedrons weighing five tons, and enclosed with aluminum panels. The tetrahedrons comprising the spires are filled by triangular aluminum panels, while the tetrahedrons between the spires are filled with a mosaic of colored glass in aluminum frame. The Air Force Academy Cadet Chapel is located in Colorado Springs, Colorado, USA. 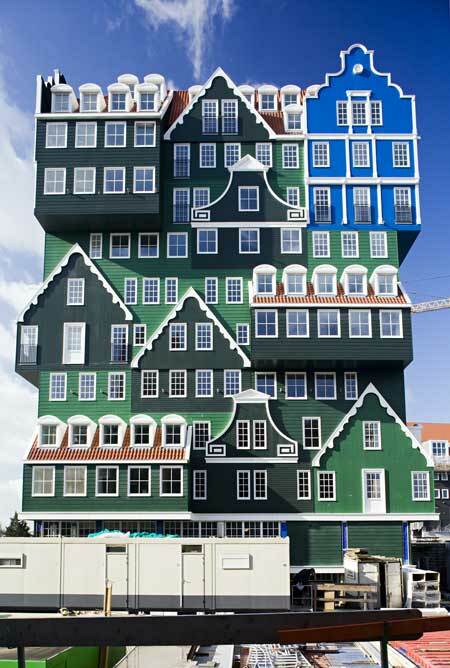 The city of Zaandam, Netherlands, hosts one of the most innovatively designed hotels in the world, the Inntel Hotel, which has the appearance of being made of stacked traditional houses. The 12 storey building offers accommodation in 160 rooms. The façade showcases 5 different types of traditional houses from the Dutch region Zaan. The architect behind this design is Wilfried van Winden. The colorful façade includes four shades of the traditional green color of the Zaan region and a blue corner piece which stands for the blue house painting by French artist Claude Monnet created during his stay in the Zaan region. The Thin House in Thurloe Square in South Kensington, London, is only 5 feet 6 wide at one end, while the other end of the building has a normal width. If you look at this from the right angle, an optical illusion creates the impression that the entire building is so narrow when in fact the house has a triangular shape. The reason for this odd shape seems to be the railway line which passes right behind the house into South Kensington underground station. The Thin House is fully functional and has become one of London’s touristic attractions for visitors who want to see something different from the usual historical attractions. Another interesting building in England is the so called Pineapple House, situated in Dunmore. This was the summerhouse of John Murray (the 4th Earl of Dunmore and last Colonial Governor of Virginia in America), who decided to add the pineapple shaped extension in 1777 after being impressed with this exotic fruit in his travels to the Indies. The pineapple cupola is around 46 feet high and each of its intricately stone carved leaves is separately drained to prevent frost damage. Also, the edges of the lowest and top leaves are designed so that water doesn’t accumulate anywhere. The property can be rented as holiday accommodation. If you are looking for accommodation at a secluded hotel which seems extracted from a fantasy tale, the Montaña Mágica Lodge is definitely an option to consider. Situated in the jungle of Southern Chile, in the centre of a 300,000-acre private nature reserve, this volcano shaped building is covered with moss and vines and “erupts” every day, spewing water instead of lava. Each of the 13 rooms is named after a local species of bird and some of them include hot tubs made of carved trunks of trees. The entire hotel seems to rise naturally directly from the ground, but it is in fact entirely made by man. Not only the stay at Montaña Mágica Lodge but also the ride there are memorable experiences. You can only get there by crossing a rope bridge. Apparently defying the laws of physics, this building has half of its length balancing over a slope. This original piece of architecture was conceptualized and designed by the Dutch firm MVRDV as an example of modern architecture adapting to nature as opposite to nature being altered to accommodate certain buildings. The cantilever works because of the rigid structure of the building, with a central concrete core and the section that sits on the ground being constructed from heavier materials than the part situated in the free space. 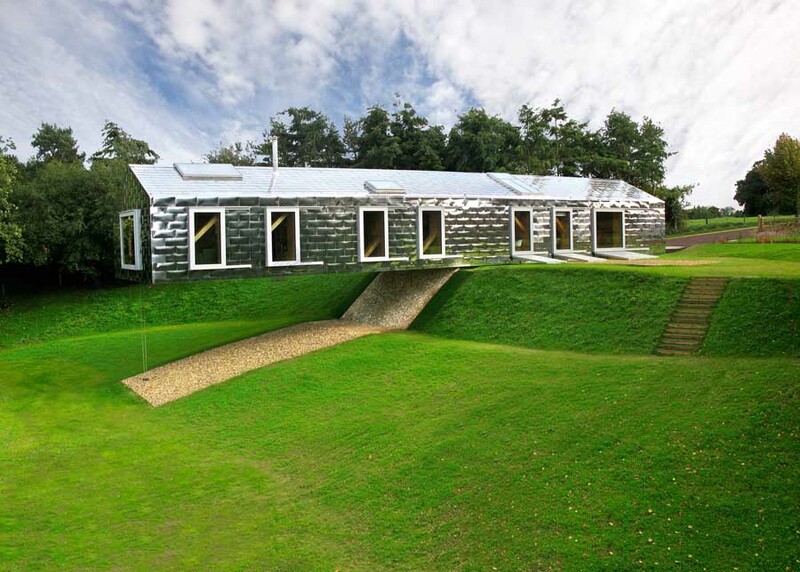 The Balancing Barn is situated near Thorington, in Suffolk, England and its shape and exterior design is mostly inspired by local barn. It can accommodate up to eight people in its 4 themed bedrooms and there’s even a hidden staircase leading to the garden beneath the building. The curved design of this original house situated near Lake Zurich in Switzerland is meant to reflect movement and fluidity, the connection between the outside and the inside. The building was designed by the Swiss architecture studio Evolution Design and has four levels including an underground garage, a living, dining and kitchen space on the ground floor, two bedrooms and two bathrooms on the first floor and a studio with two large terraces on the second floor. The boundaries between the outside and the inside are also blurred by the presence of glass walls on three sides of each room. 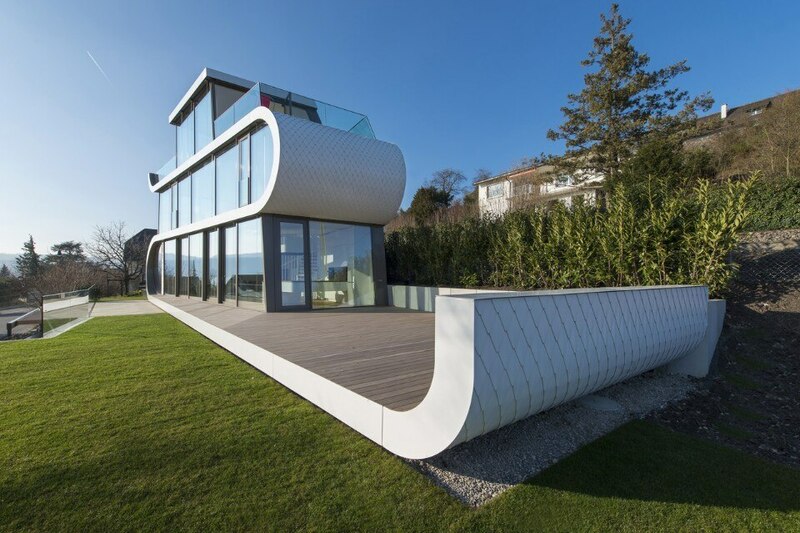 From the outside, the house resembles a futuristic vessel that sailed from the nearby Lake Zurich and docked in an unusual place. The Kunsthaus is an exhibition center of contemporary art situated on the banks of the river Mur in the city of Graz, Austria. The building itself is a piece of art that stands out from the general architecture of the surrounding constructions. Because of its odd shape, the Kunsthaus is affectionately called “The Friendly Alien” and became a landmark in the urban identity of Graz. The museum was designed by London architects Peter Cook and Colin Fournier as part of the European Capital of Culture celebrations in 2003. The building’s organic, amoeba-like shape is part of the blobitecture movement in architecture, including buildings with curved and rounded shapes. The outer skin of the Kunsthaus is a media façade with iridescent blue acrylic panels which can be changed electronically. This colorful hotel located in Langfang, Hebei Province, China depicts Fu, Lu and Shou, the Chinese gods of good fortune, prosperity and longevity. The entrance into the building is made through a door situated in the right foot of the white bearded figure, Shou. He holds The Peach of Immortality in his hand, which houses the hotel’s best suite. The ten storey high hotel may hold the Guinness World Record for the “biggest image building”, but it was also voted the ugliest building in China.